Today's round of Saturday reviews is all sippable. Yep, I'm drinking on the job. 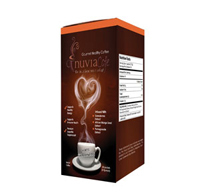 First up is Nuvia Cafe Healthy Coffee. When they contacted me and asked if I wanted samples, I said "yes" pretty quickly. I mean, it's coffee. I drink coffee every day. Usually just one cup. Sometimes two. But I don't drink instant coffee very often. I usually relegate instant to the emergency stash for the woeful day when I run out of beans and I need the morning cup before I put my shoes on and face the world. I was also a bit skeptical about the claims that the coffee is healthy. I mean, most people don't drink coffee because it's good for them. But if it's better than the usual cup, I can get onboard with that. The good-for-you stuff included gandoderma which is supposed to be good for your immuse system, African mango seed extract which is supposed to be an appetite suppressant, and pomegranate extract, which is an antioxidant. I know nothing about any of that. My concern was the taste. Although I generally don't drink instant coffee, I do find it very useful for a lot of other things. For example, it's great for adding coffee flavor without adding the extra water. Like in ice cream. Or baked goods. Or, as I used it, in iced coffee. No sense pouring hot coffee over ice and ending up with watered-down coffee. Then by the time you add milk, you've got weak iced coffee that's probably not very cold. Starting with concentrated coffee flavor over ice and adding milk results in a richer drink. Toss it in the blender, and it's even more fun. The NuviaCafe coffee was pretty good in my iced coffee. There was a slight fruitiness to it, but it wasn't like drinking raspberry flavored coffee (which I absolutely hate.) It was just a subtle sweet and fruity flavor as opposed to a harsh or bitter flavor. I really liked it. If you want to drink a healthier coffee, I suggest you investigate the health claims on your own. flipflop wines sent me five bottles of wine to taste- three white wines and two reds. First, I tried a moscato. I've only recently been drinking moscato, so I'm not any kind of expert. But I like moscato. It's a little sweet and smooth and this one was right in that ballpark. What's not to like? It's easy to drink. 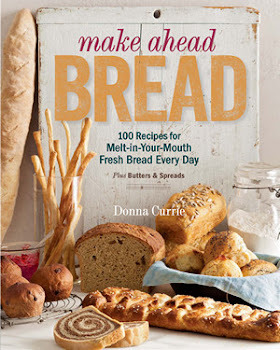 Good with spicy foods because the sweet balances the heat. I like to drink it in the evening as a little treat. Next, a sauvignon blanc. It was light, citrusy, and refreshing. A good summer-drinking wine. Another easy-drinking wine. Last of the whites was a bubbly chardonnay. Yep, you read that right. Bubbly. Chardonnay. It was a teeny bit sweet. Not super-bubbly. Not quite like a prosecco, but in that neighborhood. The two reds are waiting for an appropriate moment. The really interesting thing about flipflop wines is that a portion of the sales go to Sales4Soles, which is a charity that gets shoes to people who need them. So if you're not the super wine snob who needs to go to a wine store or winery and you want some decent wines, these are wines that can make you feel good about yourself. That's a bonus. And they're pretty good wines. No, not that kind of brew. Now we're talking about brewing coffee. 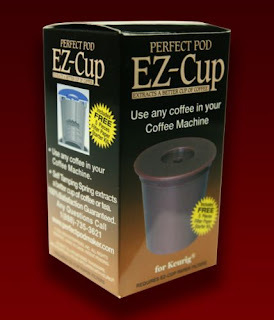 I got samples of the Perfect Pod EZ-Cup and EZ-Cup filters. Not exactly drink, these help you drink ... coffee. If you own a Keurig coffee machine, you have two choices for your coffee - you can buy the pre-filled pods. or you can buy the filter cup and use your own coffee. I've been using the filter cup an grinding my own. It makes more sense to me than the pods. The EZ Cup gives you another option. The cup is a holder for the EZ Cup filters. They're paper filters, just like you'd use in a regular coffee pot. Okay, not just like, because they're tiny. Made to fit the Keurig machines and other similar coffee makers. It's kind of a neat idea. The flavor of coffee made with a paper filter is different. Is it better? Compared to making coffee with the reusable Keurig filter, it tasted cleaner. But that's all a personal preference. I haven't done a comprehensive taste test, but for sure there was a difference. If you've used a Keurig reusable filter long enough, you know that over time it clogs up. I've gone through about three of them so far. The clogging is a slow process, so I don't notice any change in the coffee flavor from day to day. But when the filter gets to the point where the machine gives me the "clean your coffeemaker" warning and I buy a new filter, the next cup of coffee does taste better. With the paper filters, you don't have that problem. There's a new filter each time, so in theory it should always taste the same. Of course, you're discarding a paper filter each time you make a cup of coffee, but they're biodegradable. Is that better than occasionally discarding one of the reusable filters that has gotten hopelessly clogged? I really don't know. For sure it's less wasteful than all the pods. And while we're talking about discarding, I've got to say that taking out that filled paper filter is less messy than trying to dump the coffee out of the reusable Keurig filter. Filling it ... well, it took me a few tries to figure out exactly how much coffee to put in and how to deal with the little paper lid. Once I got it figured out, it made perfect sense, and I got quicker at getting it filled and screwing the lid on top of the holder. It wasn't as easy as filling the reusable Keurig filter, but than again, that's not as easy as popping in a disposable pod. It just depends on how much work you want to got through to get the cup of coffee you like. I think I'm ready for a drink How about you?